Banana Giant Fears National Security Archive “Media Campaign”. Company Says SEC Should Withhold Info on Illegal Transactions. Washington, D.C. – Chiquita Brands International last week filed a “reverse” Freedom of Information lawsuit to block the release of records to the National Security Archive on the company’s illegal payments to Colombian terrorist groups, according to the complaint filed in U.S. District Court. At issue are thousands of documents the company turned over to the Securities and Exchange Commission (SEC) from 1998-2004 as part of an investigation of the company’s illegal transactions with leftist insurgents and right-wing paramilitaries from the United Self-Defense Forces of Colombia (AUC). Two years ago, the Archive published “The Chiquita Papers,” a declassified collection of more than 5,000 pages of internal Chiquita documents turned over to the Department of Justice and the Federal Bureau of Investigation as part of a criminal investigation of more than $1.7 million in payments to the AUC over six years, and for nearly three years after the group was formally designated as a terrorist organization. That case resulted in a 2007 sentencing agreement in which Chiquita admitted to more than ten years of payments to a variety of Colombian guerrilla and paramilitary groups. 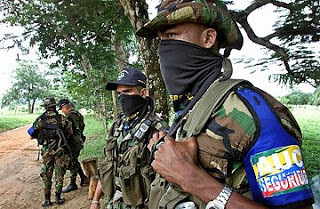 The “reverse” FOIA filing is the latest development in a four-and-a-half-year Archive legal effort to document Chiquita’s financial relationships with illegal armed groups responsible for some of the worst human rights atrocities of Colombia’s decades-old civil war. A “reverse” FOIA is a common lawsuit strategy, mostly used by contractors to prevent their cost-plus or profit-margin figures from being released by government agencies. The new case is the direct outgrowth of a 2010 lawsuit in which the Archive sought to compel the SEC to process a pair of FOIA requests relating to the Chiquita investigation. More than three years later the agency made its final decision with respect to legal, financial and other documents Chiquita turned over to the SEC during the course of its inquiries, granting confidential treatment to only 45 pages among some 23 boxes of responsive material. Chiquita’s “reverse” FOIA action follows multiple attempts on its part to convince the SEC to reverse that decision. In making its case against disclosure of the “Chiquita Payment Documents,” the company cites FOIA Exemption (7)(B), which exempts from disclosure “records or information compiled for law enforcement purposes” to the extent that production “would deprive a person of a right to a fair trial or an impartial adjudication.” 5 U.S.C. § 552(b)(7)(B). Chiquita claims that it is subject to two pending “adjudications,” a consolidated civil suit filed in Florida on behalf of victims of the terrorist groups that Chiquita funded, and a preliminary criminal investigation now underway in Colombia. The Archive is represented in the FOIA litigation against the SEC by Jeffrey Gutman, director of the Public Justice Advocacy Clinic at The George Washington University Law School.